Computer memory and hard disk space is always a determinant on how fast your computer is going to work. Whenever download are made there are files that are always left in the download memory in form of caches and when accumulated they can really make your computer perform slower. There rises the need to free this space for other useful use. 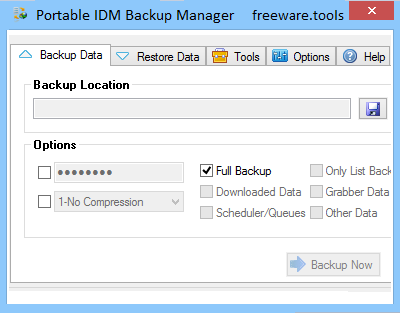 The Portable IDM backup manager is a freeware that allows one to create portable backup of this files as they can be of use. This application has a very secure way of creating a backup and restoring file that can be restored incase one need to access the files in future. This tool is a must have for all Internet Download Manager. Portable IDM Backup Manager is a software application with a pretty self-explanatory name, as it is able to backup and restore files and settings from Internet Download Manager, a handy tool whose purpose is to accelerate the speed of the downloading process while providing a rich settings menu. Portable IDM Backup Manager ensures that your information is safely stored in a specified directory, and allows users to opt for a full backup, a backup with downloaded or grabber data, history and logs, a backup with scheduled data, or only a backup list. Since this is the portable version of the program, it is important to mention that it doesn’t leave any traces in the Windows Registry, and you can copy it on any USB flash drive or other devices, and take it with you whenever you need to backup data from IDM on the breeze. The tool allows users to specify a backup and restore directory, and you can also encrypt the information by setting up passwords. Moreover, you can compress the files, and specify the compression level. Portable IDM Backup Manager provides some cleaning tools, as it allows users to opt for a full clean job or a custom one by removing the download, grabber and scheduler data, history and logs. It is also possible to erase passwords for servers and sites, and add information about file types, such as compressed files, documents, music, programs, and video. You can add a default path directory and backup folders, as well as access the log, which contains details about the entire procedure and possible errors, directly from the primary panel of the application. All things considered, Portable IDM Backup Manager proves to be an excellent software solution when it comes to backing up and restoring files and settings from IDM.